Our opening blather on Culture and Politics, a review of Woodward’s American Nations, introduced the concept of socio-political region and called attention to the importance of non-economic forces in the practice and theory of local economic development. While not rejecting the value of concepts such as economic regions, clusters, innovation economics and the like, the Curmudgeon stressed what for him is the very real existence of local socio-political cultures which feature very prominently in the day to day success of individual local economic developers and the effectiveness of the programs and strategies they employ to achieve the long-term economic development goals desired by their community. Too often, he feels, these cultural values, demographic configurations, population mobility patterns and the historical experiences of population just seem to be ignored and depreciated as important to an economic developer. Using Woodward’s American Nations, the Curmudgeon tossed into the mix the wild-eyed, must be crazy idea that the American nation is not just one big, economic base filled with one or another cluster, but is divided into a series of cultural, socio-political regions which, for Woodward, were first set in motion by the first Non-Native American migrants who first stepped into their area hundreds of years ago. Woodward says there are eleven different “nations” within the USA, but the actual number is less important than the almost incredulous proposition that these long-dead folk still live in our present day hearts, minds, and voting patterns. The Curmudgeon, himself in a blaze of arrogance, offered a partial explanation of how these ancient values and ways of thinking about government, life and individual behavior still persist–through the structures, relationships, processes of governance and administrative behavior created in their original state constitutions, nearly 70% of which are still in effect today. Patchwork Nation is chiefly about “electoral diversity and change within the U.S. federal system” (P. 1) but for us the local economic developer, it really serves to remind us that, despite our paradigmatic one size fits all economic development strategies, our state and local economic developers toil the fifty gardens of the American federal system. The re injection of federalism into economic development is the central obsession of this blather. The Curmudgeon glories in the diversity, innovation and inertia, which lie at the heart of Federalism. Federalism is about choice, individual rights, the right of communities to define their own vision and values, the right to be right–or wrong. Some call this freedom, but whether or not it is or isn’t, it is about alternatives and the ability, if not the right to live in a community that more or less reflects the way you think and believe and whose style of life–and governance offers a comfort or a stress, depending on which you prefer. The diversity inherent in federalism, for the Curmudgeon, is the heart and soul of the American experience and America’s success in governance and economic prosperity. This diversity is not about efficiency and certainly at times to some it appears absolutely irrational. For those of us who have discerned truth and constructed the correct path for policy and the future direction of the galaxy, federalism is nasty, wasteful, counterproductive, if not threatening. Federalism’s diversity allows for inertia and the perpetuation of a hopeless and unproductive past, bad choices, wrong decisions, injustice, and in so doing, Federalism offers the specter of crippling the nation’s future and destroying governmental momentum. Worse, it leads to compromise and it implies toleration with those with those who are wrong-headed or just plain evil. Federalism encourages the worst features of democracy, where Californians can be California and Alabamians be Alabamians. How can Massachusetts and Arizona coexist in the same Republic, or Texas and anybody else? Indeed, as we observed in a previous issue, federalism is sort of anathema to economic developers as well. All economic developers are certainly aware of the war that supposedly exists among the “good and bad” state business climates. Rival business climate indexes contain more negative consequence than global warming and carbon footprints have on the globe’s environment. The message underneath this business climate war is simple, just do what my index says is important and economic growth, prosperity, and truth, justice and the American way is just around the corner. In business climate theory there are no serious differences among the states or regions. All that is needed to be successful is to copy the “correct” set of policies. This minimizes actual diversity and emphasizes a nationalization of economic development strategy and programs (what we label “one size fits all”). Federalism is out of tune with much of current economic development literature and policy debate, and this mirrors our national polarization which crowds out the diversity of responses, policy, values, also experimentation-innovation inherent in federalism and sectionalism. As a profession, the Curmudgeon feels, we have in recent decades disrespected that fundamental institution around which our system of government was created. In its place, there is an increasing nationalization of policy– a one policy fits all concept. Nearly every state (and probably every regional EDO) seems to be pursuing the same high technology and manufacturing, innovation and knowledge-based, high productivity economic future, based on regional clusters, spurred on by entrepreneurial small and flexible start ups (gazelles) galvanized by university-led business accelerators and a workforce retrained by a STEM-based curriculum. Have I missed a buzz word? Oh yes, put export, sustainable or at least green in there somewhere. Talk about all our green eggs in one basket! Patchwork Nation has potential to offer the local economic developer a real in your face assessment of the socio-political environment which confronts each economic developer slaving away in state and sub-state economic development. Let’s start our review with an introductory description of the key concepts and purposes behind Patchwork Nation. Patchwork Nation is a partial antidote to all this, assuming the reader wants an antidote. Rather than dwelling on the book’s primary concern with electoral change, we shall draw instead from its second concern–“to explain political regionalism within states” (P.2). The Curmudgeon must confess that he is not especially concerned with Patchwork’s focus on electoral politics per se, but with the Patchwork’s inherent intersection with values, culture, and politics and its deep, dynamic interrelationship between geography with population movements and these shared human values and historical cultural traditions. These latter forces can coalesce to produce entities (political jurisdictions, for instance), distinctive bureaucracies (such as your EDO), patterns of governance (such as state constitutions, mayor-council or city manager form of governments etc) all of which give rise to distinctive programs, policies, strategies and creative and stupid employment of the various economic development tools and approaches. 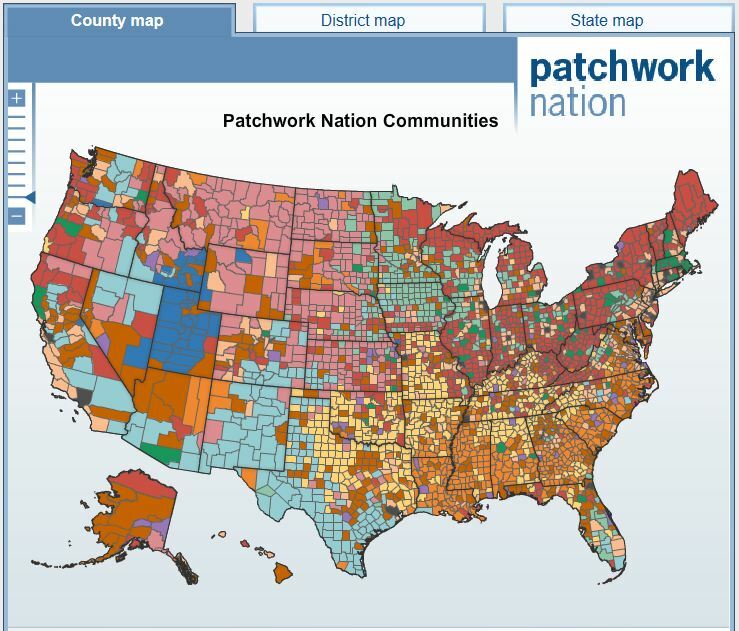 In other words, Patchwork can help us understand the diversity and variation of local economic development in our counties and communities. 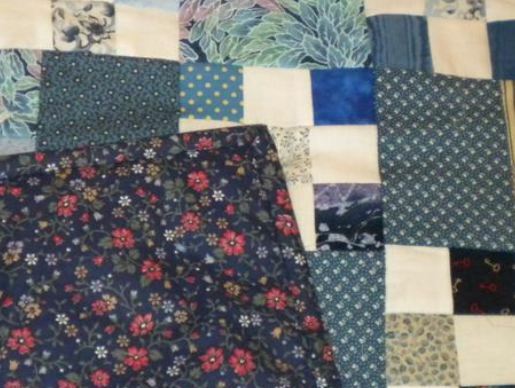 Using Patchwork and recalling that our profession itself rests upon an exceptionally diverse patchwork membership, we recognize that economic developers work in thousands of communities-jurisdictions of every conceivable size and differing economic base. In this very decentralized world in which a cacophony of differing and often competing EDOs doing their own particular “thing”, dependent upon the direction and available resources its local political or community leadership provides. Layered on this bottom-layer community-jurisdictional diversity, we can see that economic developers concurrently toil within fifty distinctive and near unique states which are themselves internally distinctive in that they are individually compose of sub state regions which are clusters of historically distinctive pattern of values, demographic groups, economic resources and needs, and business climates. The political life of each state reflects a variety of these sub-state cultural and political traditions, hued literally through centuries of population, transportation and technological change. If our economic strategies and goals can be said to come in one size and shape, it is very clear our economic developers, their communities and states decidedly do not! This diversity is the world of Patchwork Nation. OMG: THEY THINK ECONOMIC DEVELOPMENT IS POLITICAL? How does Patchwork prove its validity despite the likelihood that a critical mass of non significant R squares is poised to dismiss the concept and the diversity as either immeasurable or statistically unhelpful? Through theory of course. Patchwork Nation attaches itself to a sub discipline of geography, electoral geography, and fully utilizes the concepts and research previously developed. “Electoral geography (regions) can be investigated from two dominant perspectives (each) suggesting rather different meanings of regionalism. The first is sometimes labeled ‘the compositional approach,’ the second as ‘the contextual approach’” (P. 2-3). The compositional approach posits that any regional pattern that emerges reflects the geography of social groups which reside in the region. The region itself does nothing to shape the values, attitudes and behaviors of those who reside within its borders. The contextual approach, on the other hand, suggests that the region itself through something called political socialization can modify the values, attitudes and behaviors of the groups living within the region. Political socialization is a process by which attitudes and values can be instilled into an individual (especially a child) by the people they live with or near. Both approaches can coexist and can impact group membership and potentially an infinite variety of regional variations can occur over time on the basis of many factors. This is why each state and sub-state region can be to some degree distinctive. 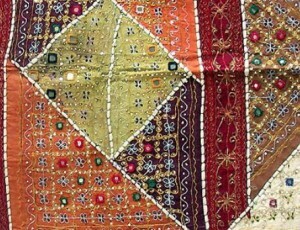 It might be dawning on the reader that as one departs from our dominant economic/rational actor-based theory which stresses uniformities and commonalities, one can discover that Patchwork’s focus on culture, history, migrations and attitude invite more concern with differences and explaining departures from the commonalities. It alerts us that the details set us apart and are perhaps more interesting, in that they can potentially better explain actual decisions and behavior. These details and distinguishing factors are for the most part laundered out of economic-rational actor models which usually utilize aggregate statistical techniques. Patchwork (and American Nations) takes us down a completely different path to economic development theory and practice. So let’s look deeper into its building block concepts so we can better understand and evaluate its analysis and conclusions. 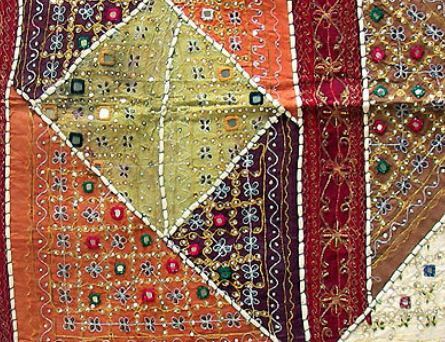 An important concept, essential to Patchwork and to the study of cultural and political regions in general, is the notion of boundary. Boundaries are not central to cluster theory and are almost irrelevant to many policies and programs derived from economics based theories (innovation, knowledge-based, entrepreneurship, for instance). After all, economic regions can bleed into each other and value and product chains can easily overlap economic regions. Innovation/knowledge-based economics transcends sub-national geographies, certainly jurisdictional boundaries, and that is an important reason why economics-derived policy prescriptions allow for an essentially one size fits all (i.e. anybody can employ these concepts regardless of one’s jurisdiction or community-type) solution. Not so with socio-political regions–boundaries do matter! “(B)oundaries are important because they define territory, and the laws and customs governing a territory structure human activity”. (P. 7) “State boundaries (in particular) have taken on great meaning partly because of the social and economic practices that are legally permitted or prohibited within them” (P. 9). Boundaries separate us from others and within each state and census defined region (and economic region, as well) we see differences, variations, and even contradictions. The boundaries of soci0-political regions, however, like economic regions are not hard and fixed. Any given socio-political region can bleed and interweave into adjacent, yet different, social regions. A socio-political region can include a variety of sub regions which themselves differ from the home-base socio-political region. The relatively soft definition of socio-political region boundaries is subsumed within a concept labeled “spatial context”. Spatial context posits that attitudes and values can be “independent of officially drawn boundaries” (P.8). Attitudes do not necessarily stop at a jurisdiction’s boundaries. Neighboring communities-jurisdictions within a social region can be different. So even through a socio-political region is defined by the dominance of a prevalent set of shared values which affect both individual decisions and administrative and structural decision-making, not everyone in the region must adhere to the dominant set of values and sub-communities of conflicting, or at least different values and structures can simultaneously exist. STATES MATTER. BUT WHAT GOES ON INSIDE STATES MATTERS MORE! While the Curmudgeon is not sure that the North-South differences have entirely faded, Patchwork’s great contribution to the present discussion is the value it places on sub-state regions and the support it provides for their importance in current politics (and presumably policy-making as well). Economic regions minimize the importance of boundaries and decry the disrupting existence of community-jurisdictions and emphasize instead a set of common policies and strategies applicable to all regions. Social regions glory in softly-defined boundaries, embrace the existence of diverse community-jurisdictions, and recommend a series of policies and strategies which appear suitable relative to the socio-political-economic fundamentals. For Patchwork, partisan affiliation and voting, while only two of a variety of potential ways to measure and define socio-political regions, are very useful because they capture the dominant and critical distinctions within the population of a socio-political region and can simultaneous demarcate the existence of any distinctive sub-communities within the overall socio-political region. To the Curmudgeon, the use of partisanship and voting as indicators of a socio-political-economic section (region) can be very helpful to a local economic developer. No one is asking anyone to like politics or to sanction “political interference” in economic development but simply to recognize that in most communities, from time to time (i.e. constantly), it happens. Economic development can be quite political and politics often deeply touches the theory and practice of local economic development. 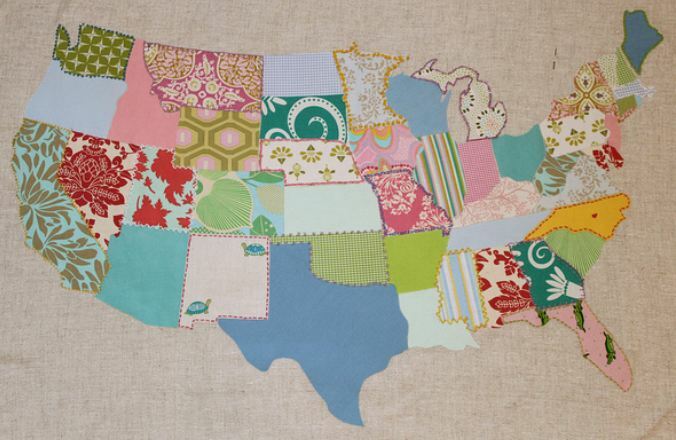 Patchwork Nation talks about “sectionalism”. Subdivisions within states, defining counties, towns and districts, to say nothing of the cognitive maps that define neighborhoods and other place locations, structure information and influence political activity, creating local variation…. It is the uneven geographic distribution of these salient political traits that we mean by the term geographic sectionalism (P.15-underlining mine). A Patchwork Nation “section” (a specifically-defined (i.e. with boundaries) socio-political region) is a sub-state geographic area which shares common patterns of partisanship. As indicated earlier, any section can include lesser geographic sub-areas whose partisanship patterns deviate from the larger sectional pattern–but the large sectional pattern dominates. Patchwork nation has continued its evolution since publication of this book (see www.patchworknation.org) and currently most of its efforts seem to revolve around the county as equivalent to the section. … the foundations of sectionalism may vary from state to state depending on the disagreements that are salient and the way populations with distinct interests are geographically concentrated (or not)…. The geographical concentration of particular population groups is not the same in every state. Often the salience of a particular type of population group is directly related to its size (this harkens back to the compositional explanation for socio-political regions). Geographic concentration and size of population groups salient to the five driving forces are therefore key to shaping the patterns of partisanship and voting in a section. The simple, easily observable fact that population groups distribute themselves unevenly, however, invites further explanation of how sections originate. For Patchwork, geographies can impose “various limitations and opportunities that attract some populations and repel others.” (P.22). Also, geographic places can create, through earlier ethnic/religious settlement patterns particular customs and lifestyle behaviors and traditions peculiar to the geography. These combined with the familiarity created by upbringing and long-standing family residence can result in a type of “home”-“this is where I belong” mental affiliation. (In this last instance the Curmudgeon is playing with some of Patchwork’s rationale (see P. 23)). These latter forces are clearly contextual in nature and they vividly demonstrate, not only Patchwork’s combining the compositional with the contextual approaches, but the softer, fuzzier side of political socialization in the formation and durability of sections. Finally, Patchwork acknowledges that sections are not timeless, fixed for eternity. Just the opposite! While voting behavior emphasizes critical elections and infrequent political realignments, other forces such as (1) conversion of existing populations from one party to another, (2) mobilization of new voters into the electorate, or (3) generational replacement of one group with another–all can result in new reconfigurations of sectionalism. Perhaps more important that such overtly political factors is the simple but powerful reality of shifting populations which Patchwork believes has been “the most important force shaping the political identity of regions within states”. (P.27). We shall save discussion on this factor for other reviews such as The Big Sort and Richard Florida’s, The Great Reset. For the Curmudgeon, Patchwork reminds the local economic developer of some factors that are probably pretty obvious, but which usually are seldom discussed. First, states matter in economic development. Second, sub-state sectionalism, a rich diversity of socio-political sub-regions, also exist and they matter even more than states. In essence, these two, can one call them insights, open up a whole new world for both economic development theory and practice? At the very least, the Curmudgeon wonders if the various distinctive sectional types exhibit different styles, employs different strategies, and maybe defines what it wants to achieve from economic development efforts a bit differently. And as a last thought, Patchwork injects that ugly word, politics, into economic development. It should be there, the Curmudgeon knows that. But he also knows that politics is there-almost always. And he is willing to bet it’s not going away soon. Economic development does not operate in a political vacuum; programs do not get adopted and (de)funded just because they work and don’t work. Different geographies can produce different types of politics and different environments within which an economic developer must operate. Politics is no more a one size fits all phenomena than is economics. But enough is enough and if the reader is game, and wants to take this one more step, try the Big Sort, or and if still game after that, Florida’s Big Reset.